According to the latest data from the Census Bureau, taxes paid by homeowners and other real estate owners remain the largest single source of revenue for state and local governments. Beginning with the third quarter of 2013, the survey of State and Local Government Tax Revenue was streamlined and now includes only four major sources of revenue; property tax, state and local individual income tax, corporate income tax, and sales tax. At 40.2%, property taxes represent the largest share of revenue generated from the four major sources. By focusing on only four sources, the quarterly survey no longer includes data on revenue from miscellaneous sources like motor fuel taxes, motor vehicle taxes, tobacco taxes, and alcohol taxes. In the second quarter of 2013, prior the change, revenue from miscellaneous sources was $74 billion or 19.3% of total state and local tax revenue for the quarter. 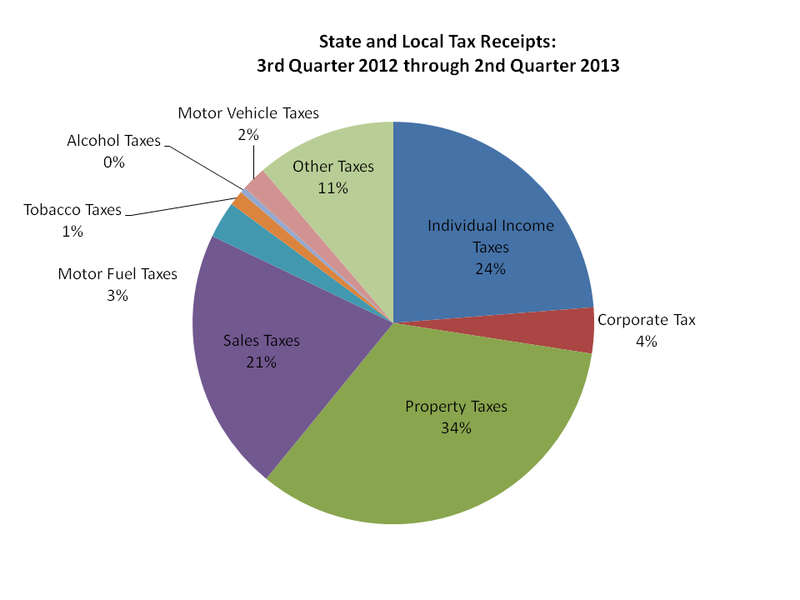 The major revenue source with the largest increase over 2012 was state and local individual income tax receipts. In 2013, approximately $344 billion in taxes were paid. This was an increase of increase of 10.0% from 2012. 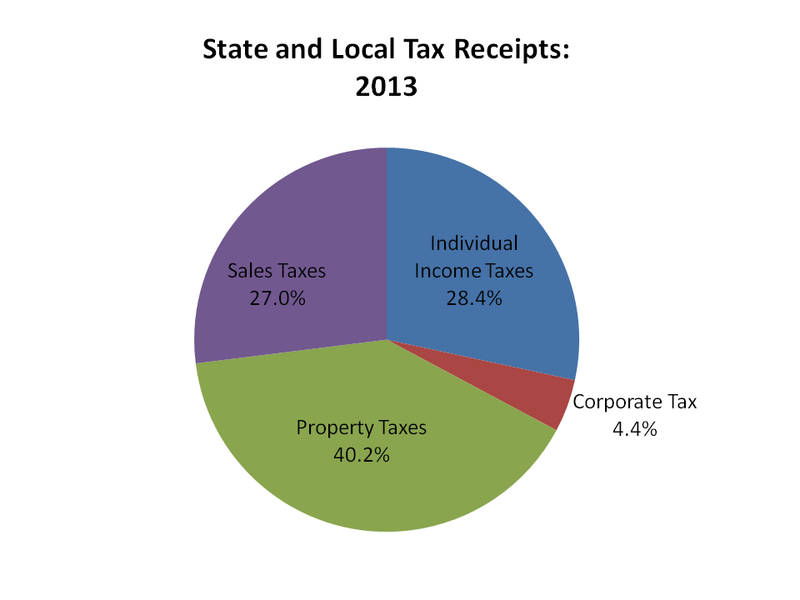 Corporate income tax receipts increased 6.6% and sales tax receipts increased by 3.4% over 2012. 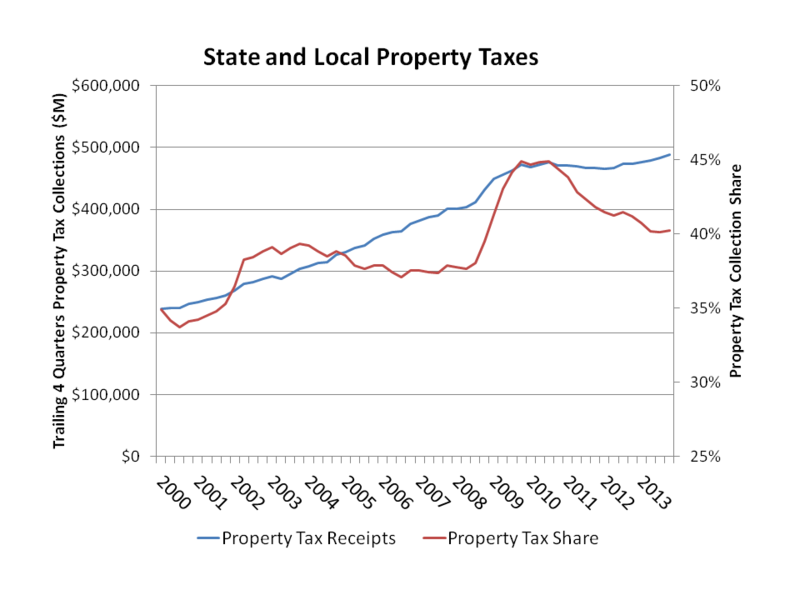 State and local government property tax collections continue to increase on a nominal basis. In 2013, approximately $488 billion in taxes were paid by property owners. This was an increase of increase of 3.1% from 2012. 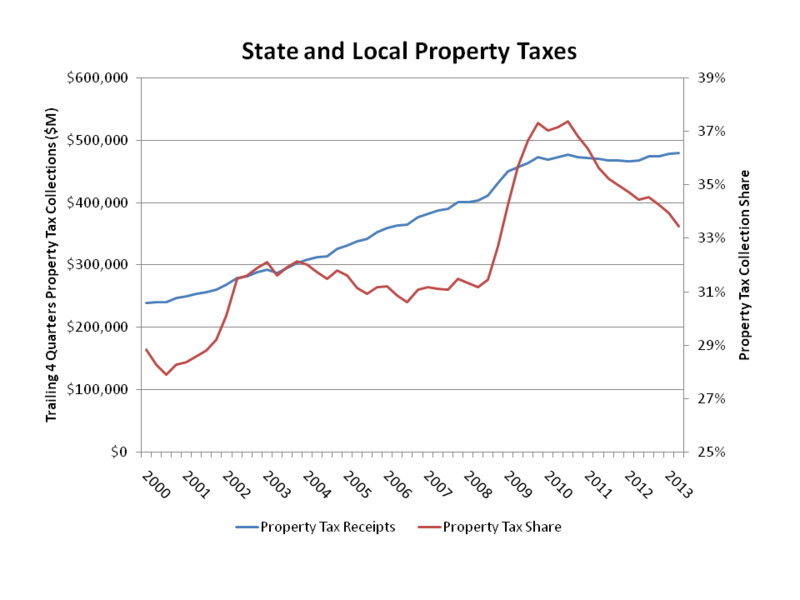 As state and local government property tax collections from the four major sources of revenue increased in recent years, the share of local tax collections due to property taxes fell from a high of 44.9% in the third quarter of 2010 to the current share of 40.2%. The average share for property taxes since 2000 is 39.2%. State and local individual income tax, corporate income tax, and sales tax collections are very responsive to changing economic conditions. The changing share of local collections is due predominantly to fluctuations in state and local individual income tax, corporate income tax, and sales tax receipts. For example, in the fourth quarter of 2009 state and local governments collected $60 billion in individual income tax. In the fourth quarter of 2013, the most recent, state and local governments collected $77.5 billion in individual income tax. The dramatic 29% increase in state and local individual income tax receipts is due to improving economic conditions, rising incomes, and higher individual income tax rates in several states. 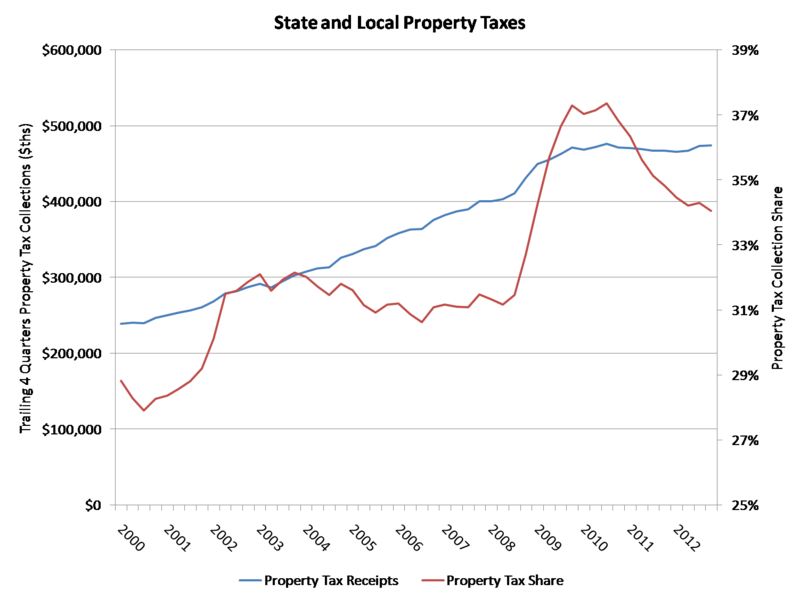 Although house prices experienced healthy increases over the last two years, one should not expect property tax collections to increase significantly. The S&P/Case-Shiller House Price Index – National Index grew by 2.6% on a not seasonally adjusted basis in the fourth quarter and 11.4% last year. Instead, lagging assessments and the ability of local jurisdiction to make annual adjustments should lead to only modest increases. An alternative to the local property tax, the land value tax offers certain benefits over the economically inefficient property tax. However, its novelty and legal and political challenges continue to make it an elusive option at this time. According to numerous polls, the most hated tax is the local property tax. 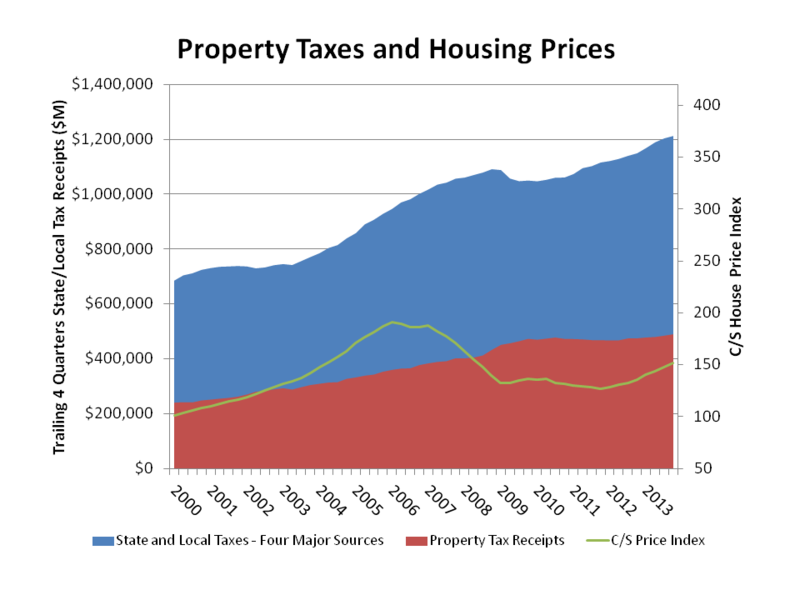 Economists Marika Cabral and Caroline Hoxby argue that Americans are averse to the property tax because it is the most noticeable and important major tax. In addition, many economists agree the property tax is economically inefficient because it taxes the value of improvements, which acts as a tax on economic development. A tax is said to be inefficient if another system could raise the same revenue while increasing economic growth. One proposed alternative to the property tax is the land value tax. The land value tax would allow state and local governments to maintain control over a significant source of tax revenue while addressing issues of efficiency. Although not used extensively, the land value tax is more than a theoretical abstraction. Local governments in New York, Pennsylvania and Hawaii have used it. In addition, twenty-five nations use some form of the land value tax. The land value tax has been implemented in two forms. In a pure land value tax system, the tax is applied to the value of the land with no tax applied on improvements. In a split-rate tax system, land value is taxed at a higher rate than improvements. For example, in Harrisburg, the 2008 tax on the value of land was 28.67 while the tax on improvements was 4.78, a ratio of 6 to 1. In addition to being more economically efficient, proponents argue that the land value tax provides an incentive for development. The evidence to support this conclusion is limited by the availability of data within the United States. Economists Oates and Schwab in a 1997 paper find a positive association between adoption of land value taxation and building activity in Pittsburgh. In a 2000 paper, economists Plassmann and Tidemann use data from 15 Pennsylvania municipalities and find a direct, positive relationship between the tax differential between land and improvements and the number of building permits. In other words, under a split-rate system, Plassmann and Tideman find evidence that the higher the land tax in relation to the improvements tax, the more building activity occurs. Elimination of the inefficient property tax system in the U.S. would be challenging because of the importance of the tax revenue to state and local governments. Property taxes are the largest single source of revenue for state and local governments, accounting for over one-third of all revenue. Opponents of the land value tax also argue that it encourages overdevelopment. The land value tax was largely blamed for the overdevelopment of Waikiki. Although unwanted higher density was most likely the result of poor planning rather than the land value tax, the county of Hawaii abolished the land value tax in 2002. A recent study, Assessing the Theory and Practice of Land Value Taxation, lays out a framework for implementing the land tax. Another study, Land Value Taxation – Theory, Evidence, and Practice, includes an exhaustive discussion of legal issues that need to be overcome in each state in order to implement the land value tax. 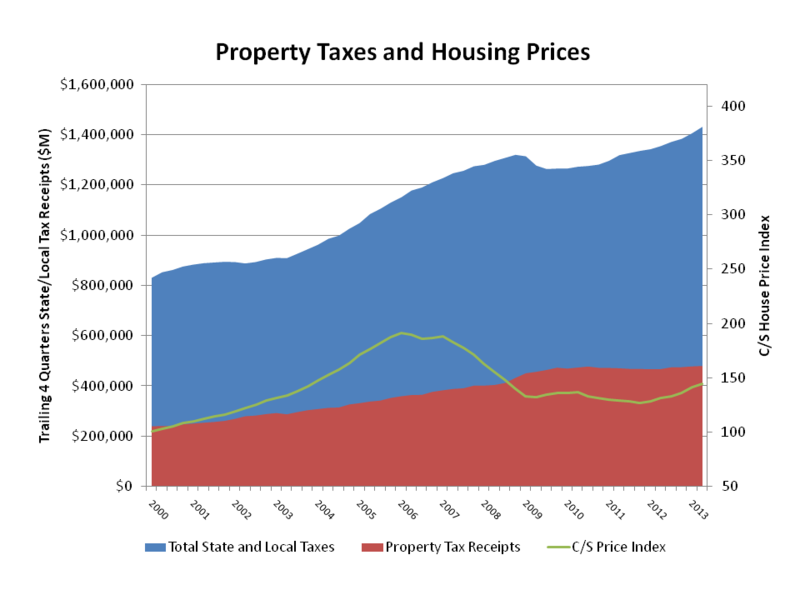 The legal and political challenges of changing the current property tax system are daunting. In spite of these challenges, Connecticut signed into law this June a pilot program allowing three municipalities the option of implementing a land value tax. The success or failure of the program will likely determine the programs expansion within the state. 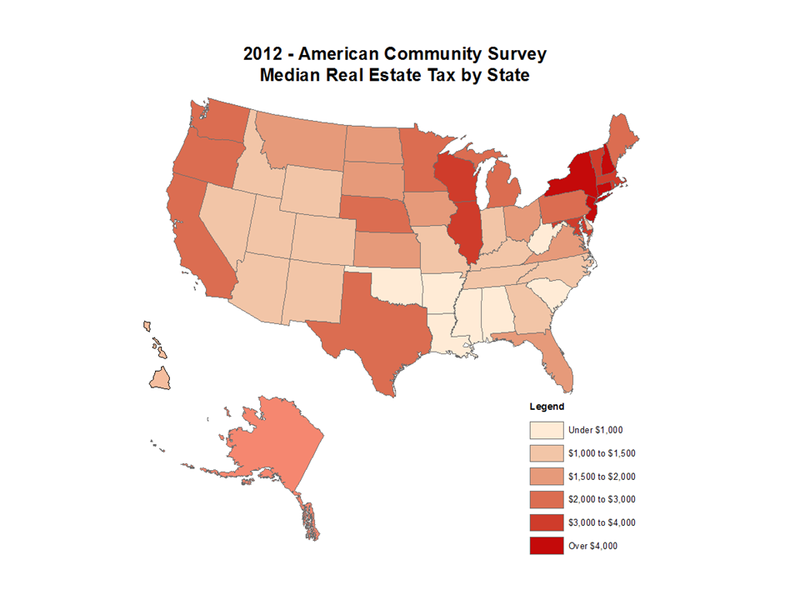 The median real estate tax bill in New Jersey was $7,183, the highest in the nation, according to the recently released 2012 American Community Survey (ACS). The median real estate tax bill, by contrast, in Alabama was $535, the lowest in the nation. Eight of the top ten highest real estate tax states are located in the Northeast while a majority of the lowest tax states were found in the South. The ACS is a survey conducted by the U.S. Census Bureau to determine how federal and state funds are distributed. About 3.5 million addresses are randomly selected to participate in the survey each year. In addition to basic demographic and financial questions, participants in owner-occupied units are asked to provide the amount of real estate taxes paid. If taxes are paid in installments, the payments are converted to a yearly basis. The total amount provided by participants includes real estate taxes on the entire property (land and buildings) payable to all taxing jurisdictions. Although total real estate taxes paid are informative, it is often useful to compare effective tax rates per $1,000 of property value by state. These numbers are presented in the fourth column of Table 1 below. Hawaii has the lowest effective real estate tax rates in the nation, $2.77 per $1,000 of home value. Two states with the highest effective rates are Illinois and New Jersey, where rates exceed $23 per $1,000 of property value. 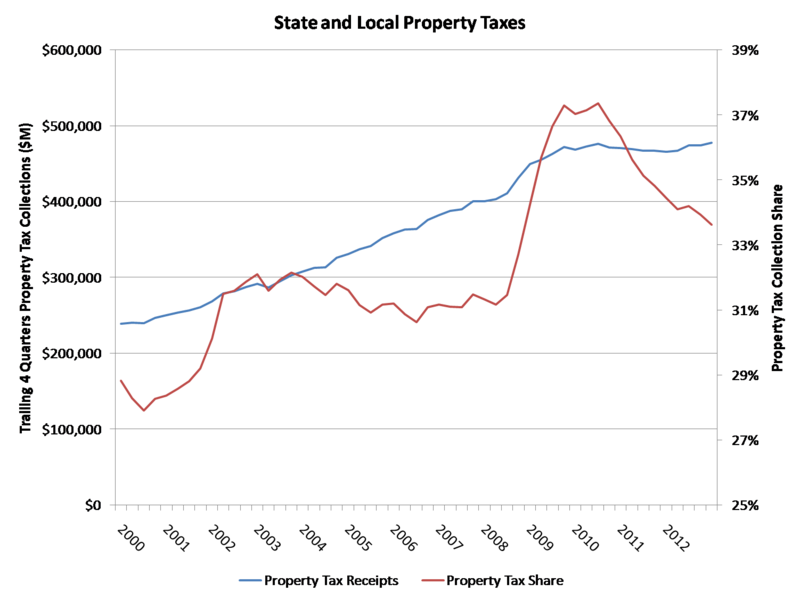 Real estate taxes are positively correlated with home values. However, cross-country differences in home values do not explain well differences in median real estate tax bills. For example, according to the 2012 ACS, Hawaii has the highest median housing value of owner occupied units but relatively low median real estate tax bill (34th) and the lowest effective tax rate. Instead property tax systems vary significantly across states. Local jurisdictions in Illinois, for example, assess real property at 33.3% of fair cash value, whereas in Idaho the standard assessment is 100% of market value. In addition, although property taxes remain the largest source of revenue for state and local governments in the United States, some states rely more heavily on property taxes as a source of revenue than others. For example, in Texas the median real estate tax bill is relatively high (16th) but residents do not pay an individual income tax at the state level. Alabama, on the other hand, has the lowest median real estate tax bill, but residents pay an individual income tax of 5% on all income over $5,000. Therefore, when comparing residential tax bills across states it is important to consider government finances. The Census Bureau’s Annual Survey of State and Local (S&L) Government Finances helps explain some of these sizeable cross-country differences in the median real estate tax bill. The last column of table 1 shows statewide property taxes as a share of S&L government own-source tax revenue, based on data from the most recently available 2011 survey. Correlation indicates the strength and direction of a linear relationship between two variables and ranges from -1 to 1. Larger correlation numbers (i.e., further away from zero) mean that variables tend to move closer together in the same (positive correlation) or opposite direction (negative correlation). Zero correlation means that changes in two variables are completely independent or unrelated to each other. During the last four quarters, state and local government property tax collections reached a historic high on a nominal dollar basis, according to the latest data from the Census Bureau. From the second quarter of 2012 through the end of the first quarter of 2013, approximately $478 billion of tax was paid by property owners. This exceeds the previous trailing four-quarter record of $476.5 billion, set at the end of the third quarter 2010. Property taxes are an important source of revenue for state and local governments to finance services, particularly education. Some analysts expected large declines in property tax collections in the wake of the Great Recession. However, this drop never happened, despite historic price declines for owner-occupied housing. At its peak, property tax collections had fallen only 2.26%. As state/local income and corporate tax receipts recovered in recent years, the share of local tax collections due to property taxes fell from recession highs. 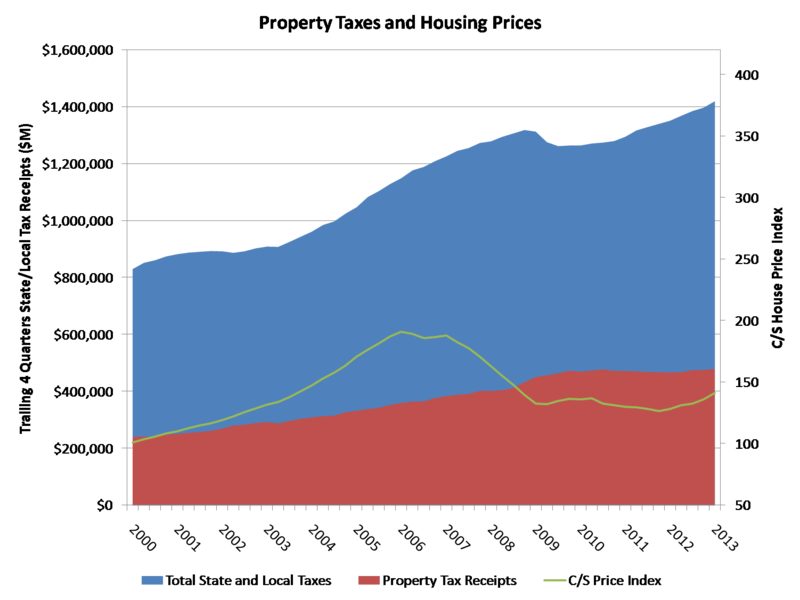 The average share for property taxes since 2000 is 32.3%, while the current share stands at 33.6%. The decline in housing prices since 2006 led many to incorrectly conclude that property tax payments would also significantly fall. According to the Case-Shiller national house price index, with the recent rebound in values, housing prices are down on net 26% over the last six years. Yet property tax collections have actually risen. While the stock of taxable real property has increased, the disconnect between the decline in values and total taxes paid means that the effective tax homeowners pay on their homes remains high. There are several reasons why property taxes have not dropped with housing values. First, assessments of value tend to lag. Second, property tax authorities can adjust tax rates (such as millage rates in many jurisdictions) thus increasing rates as property values decline, holding receipts approximately constant. However, such policy actions mean the effective rate of tax (taxes paid divided by the property value) on the property increases. Taxes paid by homeowners and other real estate owners remain the largest single source of revenue for state and local governments. 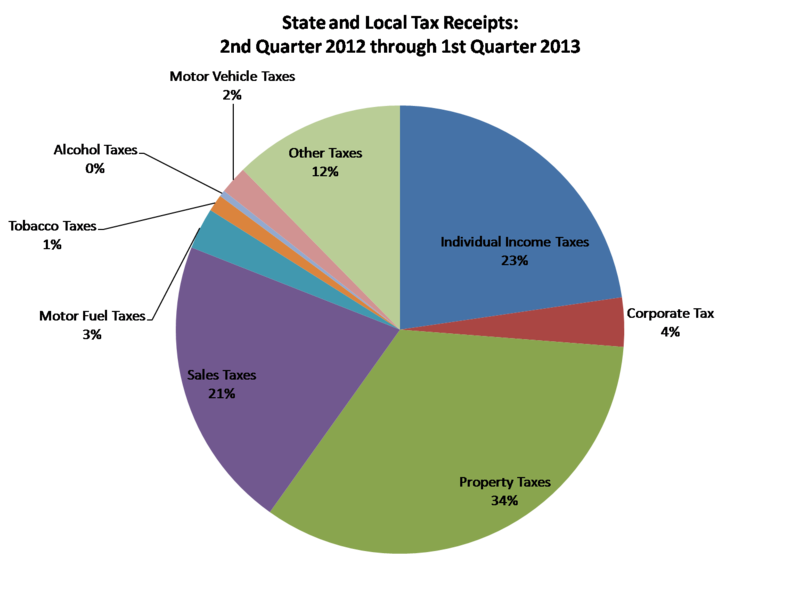 At 34%, property taxes represent a significantly larger share than the next largest sources: individual income taxes (23%) and sales taxes (21%). Property taxes are an important source of revenue for state and local governments to finance services, particularly education. Some analysts expected large declines in property tax collections for state and local governments in the wake of the Great Recession. However, this drop has never happened, despite historic price declines for owner-occupied housing. In fact, recent data demonstrate that nominal property tax collections are on the rise again, leading to higher effective property rates for homeowners and other property owners. According to the latest data from the Census Bureau, over the course of 2012, approximately $474 billion of tax was paid by property owners. As state/local income and corporate tax receipts recovered in recent years, the share of local tax collections due to property taxes fell from recession highs. The average share for property taxes since 2000 is 32.3%, while the current share stands at 34.1%. Consequently, housing and other real estate owners are still paying a higher than average percentage of total state and local government tax receipts. This elevated tax burden is significant, especially when one considers the decline in housing prices since 2006 – a decline that led many to incorrectly conclude that property tax payments would also significantly fall. According to the Case-Shiller national house price index, with the recent rebound in values, housing prices are down on net 29% over the last six years. Yet the decline of property taxes paid from the peak level is negligible (0.5%). This means that the effective tax homeowners pay on their homes remains high. Taxes paid by homeowners and other real estate owners remain the largest single source of taxes for state and local governments. At 34%, property taxes represent a significantly larger share than the next largest sources: individual income taxes (22%) and sales taxes (21%).